Black Lantern Firestorm made his first appearance in Blackest Night #2. Admittedly it was just a cameo, but he was there. If you haven’t picked up the issue yet, you may still be able to find copies. Blackest Night #3 is scheduled to be released on September 16. This issue is of particular importance for Firestorm fans because the Jason Rusch Firestorm comes face-to-face with the Black Lantern Firestorm! There is even a variant cover by Ethan Van Sciver depicting their encounter. Be sure to tell your comic shop retailer to hold you a copy of that variant cover. It’s phenomenal! DC has announced a release date for the Black Lantern Firestorm action figure. The figure is scheduled for release on April 14, 2010. I know, that’s like forever away. Tell me about it. I’m heading to Dragon*Con in Atlanta this coming weekend. George Perez is scheduled to be there. I’m hoping to get him to sign some old Flash comics in which he drew the Firestorm back-up stories. I stumbled across a Firestorm fan page on Facebook. Click here to visit the site and then become a “fan”. I’m not affiliated with this fan site, but I think it’s pretty cool. Eric over at Shonborn’s Carpal Tunnel did a great drawing of Firestorm reimagining him as a Kirby-esque New God. Eric was kind enough to grant permission to reprint the drawing here. I think he did a really good job capturing the New Gods spirit while paying tribute to Firestorm’s costume. Remember those old Capcom arcade games where two characters fight? Turns out lots of people have been playing and developing customizable versions of those old games. Over at CVG United they’ve put together a downloadable Firestorm skin for these games. I don’t play them myself, but it sure looks like fun! You can see screen shots of Firestorm flying, blasting, turning intangible, transmuting projectiles, and even transforming from two people into Firestorm. There are skins for the classic Firestorm, Jason Rusch, and the Black Lantern Firestorm. I especially like that you can see the floating face of Professor Stein in the “winning pose”. Click here for more. Andrew over at the Comics Bronze Age blog recently did a review of Firestorm vol. I #1 from 1978. He was fairly critical of the issue in his review, but he admitted that he is a fan of the character. Hopefully his review in September of Fury of Firestorm The Nuclear Man vol. II #1 (1982) will be more complimentary. Want to read an issue of DC Comics Presents starring Firestorm, Superman, and Captain Atom? Check out this post from Mail It To Team-up and enjoy! Our friend Jon over at the Firestorm-themed Fizzit blog shared a recent acquisition of his. 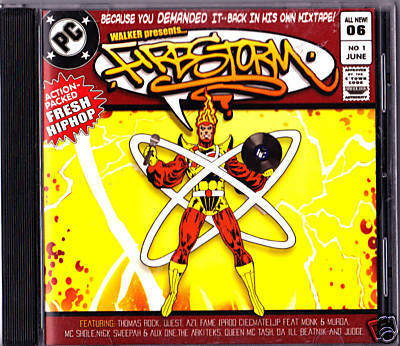 He picked up a hip-hop CD on eBay featuring Firestorm on the cover. The disc itself is called, “Walker Presents Firestorm”. Below is an image of the cover. Clearly this wasn’t authorized, but it’s still interesting. Click here to view the eBay entry listing the various songs. Thanks for sharing, Jon! Also, be sure to check out Jon’s recent Fizzit blog entries. He’s made some astute observations about the consistency of Black Lantern Firestorm’s costume, and he’s put together his own awesome Black Lantern Firestorm shirt. Click here to visit the Fizzit blog. Finally, a couple weeks ago I asked for feedback on the FIRESTORM FAN site. My thanks to everyone who sent in their thoughts! The one thing that was requested the most was more news on upcoming Firestorm appearances and merchandise (hence today’s post). The rest of the results were a bit of a mixed bag, which tells me a variety of posts are probably the best plan. Some items that stuck out as popular requests were: villain character studies, summaries of old issues, creator interviews, and art/sketches. I’ll do my best to keep cranking out posts for you match-heads to enjoy! Posted in: Blackest Night, Comic books, George Perez, Links/websites, News, Sketch/Art, Toys. I mean, yeah, in his early days he was a hotshot teenager but I think he grew up a lot over the years. Maybe like a lot of people Geoff Johns just stopped reading Firestorm at about issue #50.